Looking for ideas on how to make some cleaner cuts. 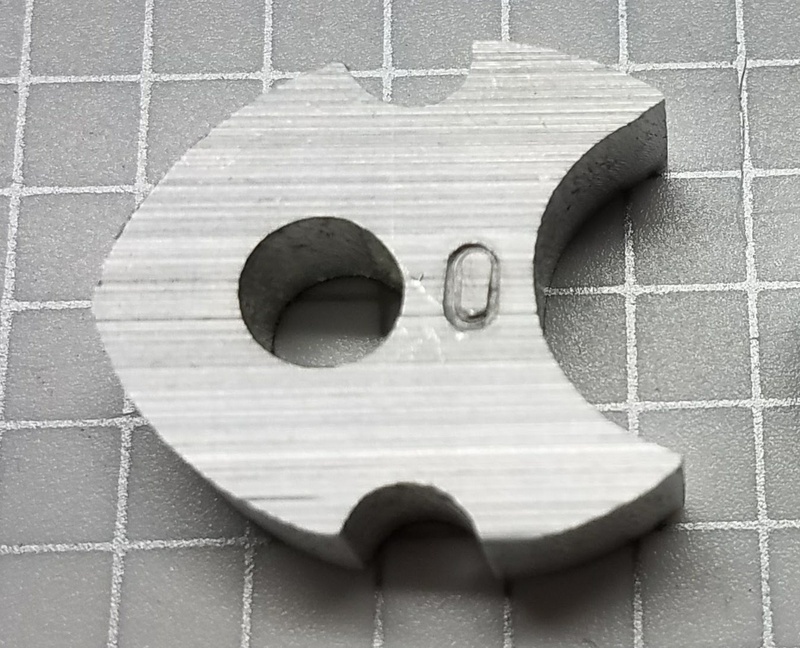 I created a little 1/4" thick widget to test my Aluminum cutting to see if I can improve my surface quality. The idea was to have something relatively small with both convex and concave surfaces. 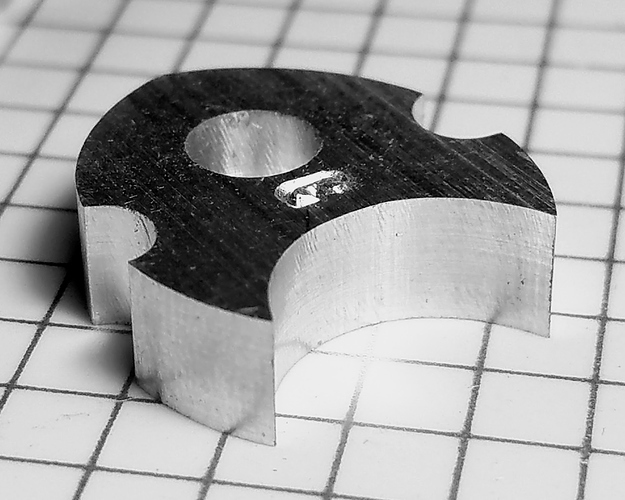 I cut the shape out using 2D Adaptive (trochoidal milling) and am happy with how that worked. Then I took some finish passes to take out the machining marks and this is what I was left with. I was kind of hoping for better. If this is as good as it gets than I can make it work. But if I can do better I would like to. Finish passes climb or not? Climbing cuts. I edited the original post to include that. I’m no aluminum milling expert, but are you removing enough material at those amounts and feeds, or are you just rubbing? Does the final pass actually improve the finish quality? Am I cutting or rubbing? 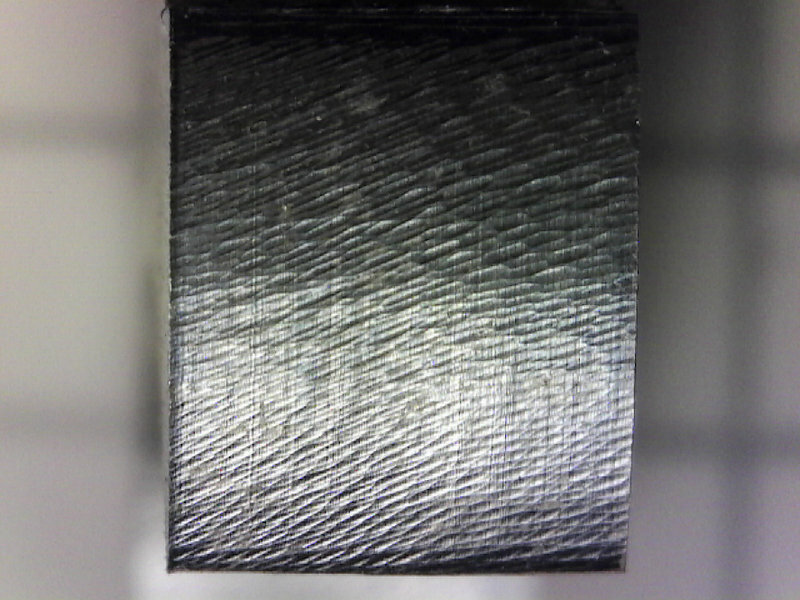 For the roughing stage, GWizard recommended a 0.012 to 0.005 depth of cut. It is pretty good about warning about rubbing. I figured a 0.010 to 0.005 finishing cut would not be rubbing. Is the finishing pass improving anything? What about conventional vs climbing cut? My cutting strategy is to cut the hole, then put a screw through the hold with a washer to hold the piece while I mill around it (no tabs). This worked fine 6 out of 7 times with a climbing cut. It failed twice in a row with a conventional cut. It seems that the conventional cut pushes the piece a lot more. I don’t see an improvement on surface quality with the conventional cut. 1st, not the best coating to choose. Use HSS or a non “Al” coated end mill. It’s hard to find HSS for whatever reason. This clearly isn’t a super-cheapo end mill (I haven’t seen anything cheap that isn’t square or round). 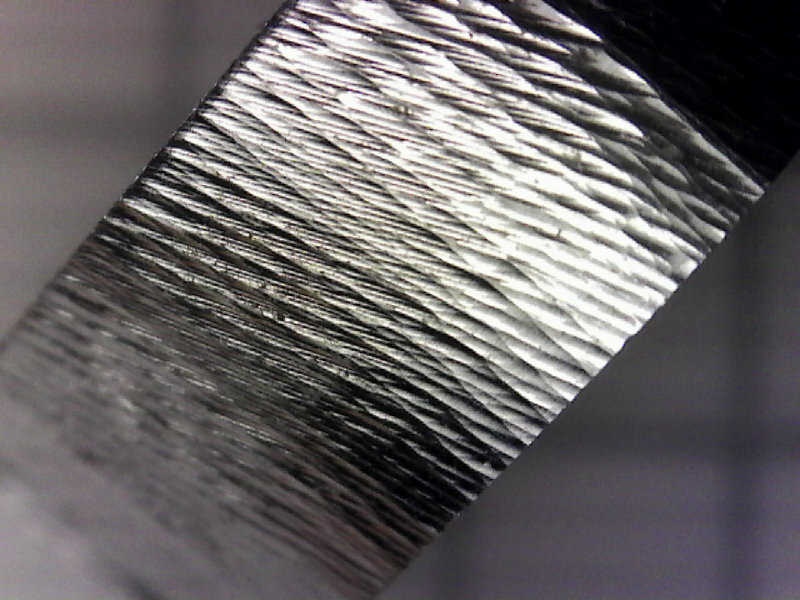 Did you look at the end mill under magnification? Anything stuck to it? 2nd, Slow the spindle down. Run it at minimum speed (1). 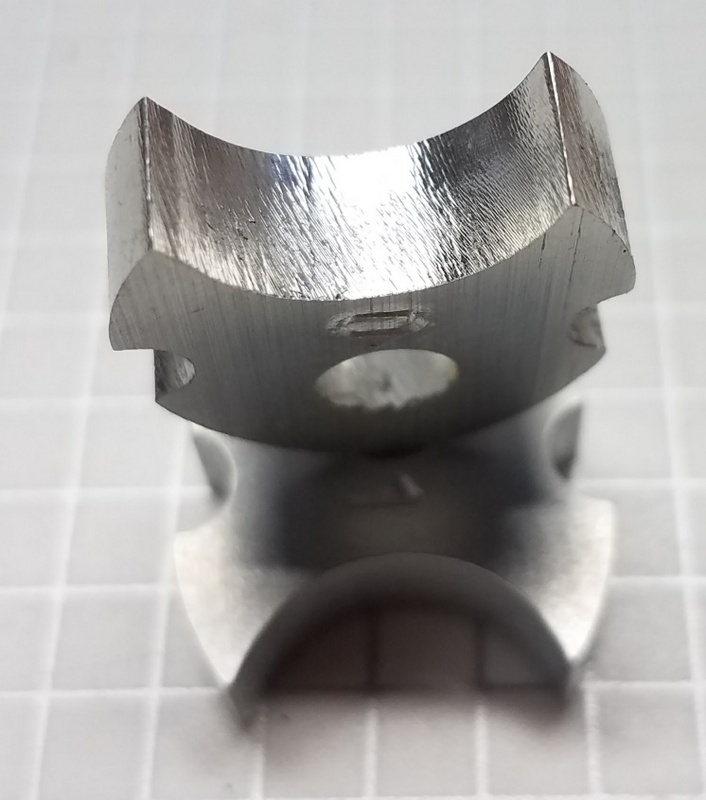 3rd, I get much better results at a much slower feed (~12ipm), with a very small DOC, like .005"
4th, Coated and uncoated single flute bits have worked really, really well for me a few times…right up until I break the “beak”. You might get better results with a 1/4" end mill instead of 1/8". It’ll never be perfect. It’s a little hard to understand the scale of the marks - that doesn’t look like rubbing. It looks a bit like chatter in the zoomed out views (especially the end on view under “I was kind of hoping for better”). What did it look like before the finish passes? Is this just chatter from the roughing passes that the finish pass can’t reach? What alloy is this? I’ve had a couple “unknown” alloys that looked a lot like this. 6061 machines pretty nicely. The coating seems to be working. After 11 widgets the bit looks new, nothing stuck to it anywhere. 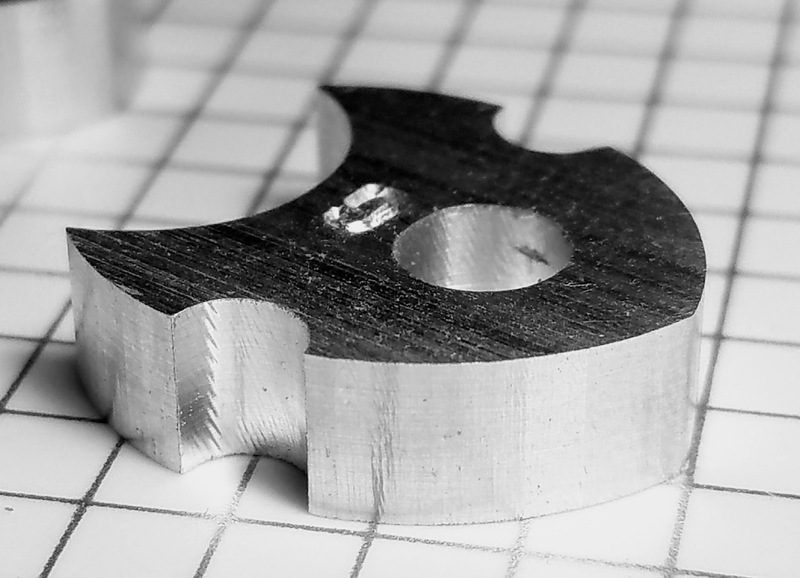 To get the detail I am looking for I need to use a 1/8" end mill, that is why I am testing with this size. After poking around a bit I discovered that GWizard uses RPM as an input, I thought it was a calculated recommendation. So I slowed it down to 17,000rpm. Tried another run with a two 0.005" finishing passes at 10ipm followed by another pass around the part. Similar chatter pattern, but much less pronounced. If this was as good as it gets I would be pretty happy. GWizard shows warnings that the chipload is too small and I am likely to rub when the feed rate drops below 7ipm. So it looks like I can go a bit slower. Well, I’d say that actually looks pretty good. Touch it with some scotchbrite and it’ll look great. I haven’t found any cheap ZRN bits on ebay, they tend to be a bit more expensive. Good work, that looks like a substantial jump in finish quality. Have you tried any cooling or lubrication? A little WD40 or a mist coolant system might work wonders. Is the cut open on one side, or is it covered on both sides? Some chip evacuation may help if there is nowhere for chips to go. I would also try to slow the spindle down. I got the best results at around 17,500 RPM, which is what is recomended on the wiki. Does not seem to cut cleanly, but pushing through work piece. GWizard warns of tool rubbing when running slower than 11ipm, so I don’t think I was rubbing at 30ipm. 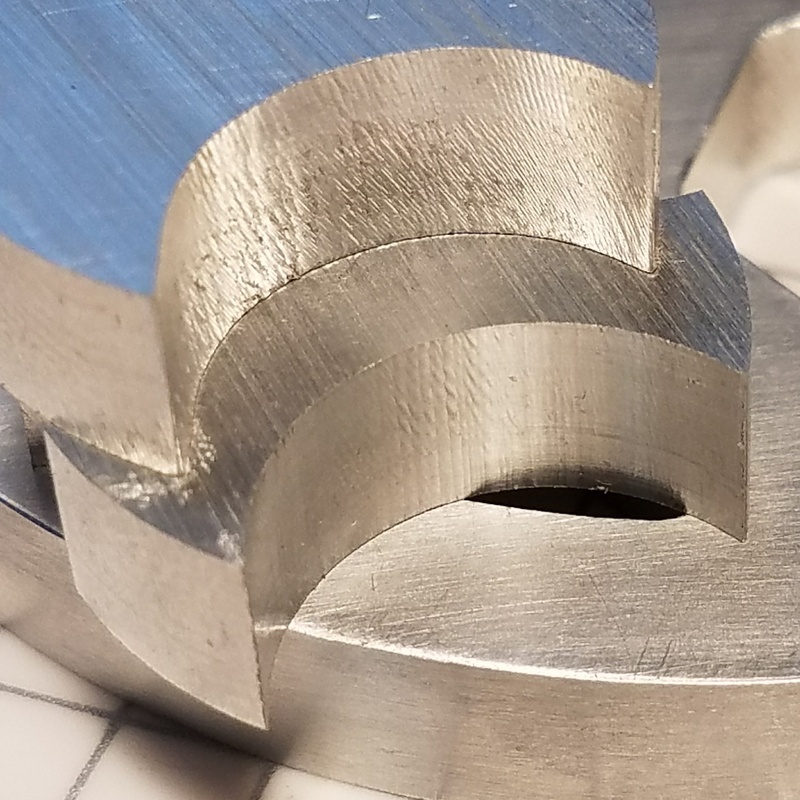 When the ZRN coated end mill finished the cut around the perimeter of the part I thought the part has shifted because it broke through and started cutting very roughly. I decided that the part has not shifted and ran the program again. Even though it was passing through areas that were already cut, it continued to remove material. It was as though it was not cutting cleanly the first pass. The cut quality is excellent, but the performance is unacceptable. The ZRN is a $10 endmill from onlinecarbide.com and is USA made. Not the cheapest imported end mill made, but certainly the cheapest I could find on ebay. To what do I attribute the improved cut quality? 3 flutes instead of 2, (there is an edge always engaged in the work)? Helix Angle (steeper angle = better cut)? Coating (ZRN as opposed to TiAlN)? To what do I attribute the poorer performance and heat buildup? Poorly designed/ground edge on cheap endmill? How are you clamping your parts? Make sure you are using the shortest end mill that will work. The harmonics get much worse the longer the flutes are. I don’t machine aluminum much but I think I remember more than one person recommending single flute end mills for aluminum. Check out Winston Moy’s YouTube videos. He recently posted one where he made some aluminum coasters for Elon Musk. I can’t remember if he used a Nomad or a SO3 for that project but they came out looking great. Same cut parameters as in the last post. 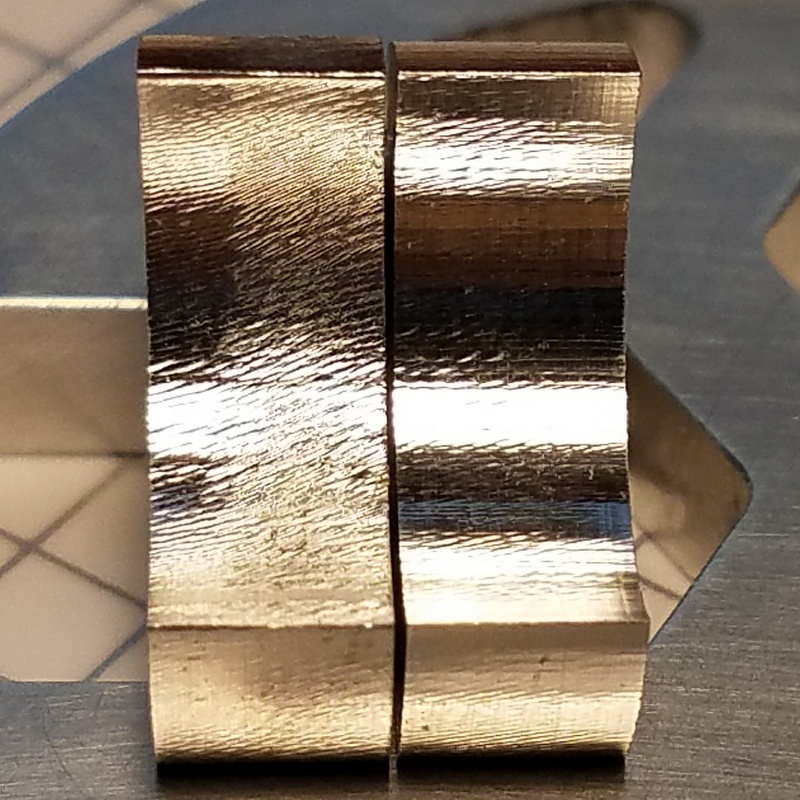 New bit had a similar issue toward the end of the cut where there was some sudden movement and it appeared the work piece had shifted or a stepper motor skipped a step. But when I let it finish all the cuts lined up and it looked fine. There was no shifting or skipping. Cut quality is a shade better than the 3 flute ZRN mill but without the heat build up. Do you have the new Z motor plate or the OLD style? 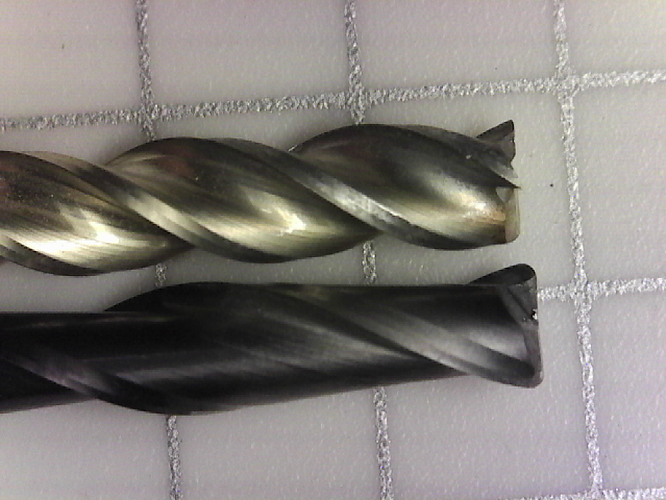 Cheap end mills (usually) perform poorly, regardless of the coating. i have the new Z motor plate. When I’m done with the final pass, the finish is outstanding. If I need a polished finish, I use 800 wet/dry with some water or WD40 and then buff out. Beautiful polished finish.